(520) 724-7222, Click here for Lost and Found Pet page. 2. Humane Society of Southern Arizona: 520-327-6088, ext. 111 Go to Lost and Found page. 3. Post on Next Door, a neighborhood social media site. 5. Also, email Meg at mmcjohnson@cox.net and she will include a notice in the next Garden District e-newsletter. Please include a specific description, contact information, and a picture if possible. You should also make a personal search of our shelter at 635 W. Roger Road, every day. Our lost and found phone number is 327-6088, ext. 111. 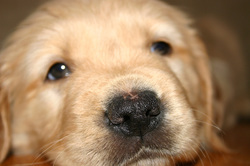 You may also attach a digital photograph (JPEG) of your pet at *protected email*. Take immediate action to locate your lost pet! You can download a Lost Dog or Lost Cat flier to post in your neighborhood. Fill out the PDF on your computer (Adobe Acrobat Reader required), including adding a photo, and print out what you need to post. You can also download and print out the flier to fill in manually. Call Pima Animal Care Center at 724-7222, and visit the shelter in person at 4000 N. Silverbell Road daily to view all incoming animals. Frequent, personal visits are important; do not rely on phone information alone! Immediately talk to neighbors and post notices throughout the neighborhood and at all major intersections near where the pet was lost. Place a Lost Pet ad on Craigslist's Lost and Found Pets section. As soon as possible, place a “Lost Animal” ad in the Arizona Daily Star at 573-4343. Please also check the found ads every day. If your pet is microchipped, notify the company with which the chip is registered, and be sure your information is up to date. If your pet has been brought to us as a stray, please see our reclaiming fees. Found PetsIf you have found a stray dog or cat that has identification tags, please call the owner immediately. If the pet does not have identification tags you can take the pet to most veterinary offices, Pima Animal Care or the HSSA to have the pet scanned for a microchip. Call in a found report to 327-6088, ext. 111, as soon as possible. Time is critical in returning the pet to its rightful owner. Please be prepared to provide us with as much information as possible about the location where it was found, its health, temperament, and any available information. This will help us in locating the pet’s owner. File a found report with our shelter at 635 W. Roger Rd. Our lost and found phone number is 327-6088, extension 111. Post found dog or found cat fliers in your neighborhood. You can download a Found Dog or Found Cat flier to post in your neighborhood. Fill out the PDF on your computer (Adobe Acrobat Reader required), including adding a photo, and print out what you need to post. You can also download and print out the flier to fill in manually. Place a “Found Animal” ad on Craigslist and Facebook's "Lost and Found Pets of Pima County" page. Please also check the found ads online and in the newspaper on a daily basis. If you find a stray, contact us immediately so we may help search for its owner. Our lost and found phone number is 327-6088, ext. 111. If You Must Surrender the AnimalThere is a $45 animal care fee to surrender a found pet to the HSSA. Click here for more information. Services provided by the Tucson Wildlife Center include an emergency help line operating 24/7, capture and transportation of injured animals, 24-hour emergency room, volunteer DVM on call, rehabilitation, release, and education. All services are provided free to the public. Our sole support comes from YOU. A Non-profit organization dedicated to the rescue, rehabilitation, and release of injured and orphaned wild animals throughout southern Arizona. and hunt in our neighborhood. Never allow your pets to run free! 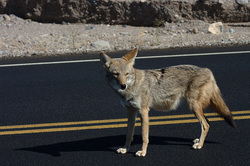 The Arizona Game & Fish Department notes, "If you see a coyote near your home, don't ignore it. This may cause it to lose its natural fear of people, which can eventually lead to aggressive behavior. * Shout and bang pots and pans or rattle empty soda cans with pebbles in it (coyote shaker). * Wave your hands or objects like sticks and brooms. * Throw small stones or cans. * Spray the coyote with a hose. * Use a commercial repellent like Mace, if necessary, on bold animals that refuse to leave." Unless it is an emergency, DO NOT kill a wild animal. A valid hunting license is usually required to kill predators such as coyotes, and state law bans firing a gun within a quarter-mile of an occupied residence or building while taking wildlife, unless you have the owner's permission. Also shooting firearms within city limits can carry felony charges. If you feel a wild animal presents a threat (e.g., aggressive, approaching a person, biting, or growling and snarling) call the AZ Game & Fish Department Monday-Friday from 8 a.m. to 5 p.m. at (520) 628-5376. After hours and weekends, a radio dispatcher is available at (623) 236-7201. Also, see The Arizona Game & Fish Department's "Living With Coyotes" brochure.